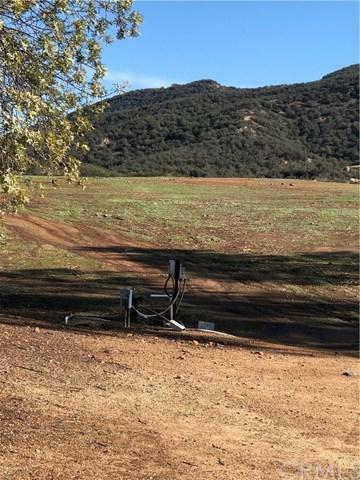 25600 Catt Road, Wildomar, CA 92595 (#SW18265257) :: Ardent Real Estate Group, Inc.
WITH A DEPOSIT DOWN SELLER MAY CARRY***10 ACRES IN WILDOMAR********* Bring your plans to design and build your own Custom Home on a private road with both high end custom home neighbors and a tract development less than a 1/2 mile away. The property has spectacularviews and the front 5 acres are all leveled out and graded. It has 2 wells on property 1 well has a new pump with electricalconnection for Generator. 2 Septic tanks. New Partial fence around property. 1500 Gallon water tank with irrigation piping. Both wells are approx. 80 ft deep and approx. 18 gallons per hour flow.Upper terrace with graded road. Multiple shaded trees in some areas. A history of permitted manufactured housing. One area has a pad to place your manufactured home on it or use as a pad for a barn or shed. Possible suitable for subdivision according to theCity of Wildomar planning. Buyer to look into City for approval. Close to 215 and 15 freeways and close to Hospital and shoppingfor easy access. A must see land to appreciate the value this land has to offer.